GB Team Manager Tony Parmiter said, 'Many thanks to everyone who attended and helped make the Selection Day such a success and especially Mike Bacon for Judging and setting challenging FCI Courses. FMBB World Championship is the biggest one-breed Championship. You can see all four varieties of the Belgian Shepherd Dog performing in IPO, Agility, Obedience, Mondioring, Canicross and Conformation (FMBB World show). More then 500 dogs from different countries all over the world are expected. Following the BSD Team Selection Day held last autumn, a squad of eight dog/handler partnerships were chosen to represent Great Britain at the FMBB World Championship in April 2017 in Halle/Saale, Germany. The event last took place there in 2010. The majority of the Squad was able to attend a training session with Lee Gibson, which we all enjoyed, especially after it was known that we would be running on 3G-type Astroturf. Preparation for the trip included taking clothing for all weathers as last May in mid-France had been cold and wet and this was still April. We all met at Sainsbury's by the M20 in Ashford for fuel at 06.30am. Some participants had travelled from as far as Cornwall and West Yorkshire. We were soon heading for the Channel Tunnel - six vehicles, 13 people and 11 dogs. Despite all checking-in together, two of our party didn’t get on the 07.50am departure, but soon we were all heading along the coast road in France. Only one hour was 'lost' due to CET (Central European Time). Then into Belgium through Antwerp and the Netherlands and Germany for the overnight stop at Neheim beyond the vast conurbation of the Ruhr, some 315 miles, where we all arrived at a similar time. We settled into the Ibis Stiles Hotel and ate at a nearby restaurant booked for us. It was an early start the next morning for continuation east, passing Kassel for the Am Stadion venue at Halle (Saale), near to Leipzig, some 225 miles. Both Cruise Controls and sat navs were useful again. Those arriving first had the job of finding the entrance to the venue - no easy task due to the lack of signage. We then had to assess the site and figure out where to put up our tents. This year there was very little room and a slope around the training pitch didn't help, but we managed to find one before all the space was taken. The venue hotel was the TRYP Wyndham in Neustadt, located in an area of high-rise flats and shops which appeared to have been totally taken over by the event, or so it seemed at breakfast times and for the evening meals. Luckily, there was a park for exercise virtually opposite although we did need to cross a dual-carriageway and unprotected tram routes in both directions. Parking could have been a problem with 2.00m headroom to the underground garage and ramp down but, with typical British resolve, we commandeered the coach parking area. Wednesday was Registration and then Thursday was the Official Practice, a frantic 12 minutes for us with just one and half minutes per entry on the course. This required skilful use of two halves of the course which were set out for acclimatisation with the equipment supplied and running surface. This included thin aluminium poles held together by two magnets with similar holding cups to the wing, so easily ‘pinged’’. Then came the the Vet Check. It was imperative that our records were all in order and microchip would read. This was followed by the Team Leader Meeting. It was a chaotic affair with everyone trying to speak at once and decisions being make on the hoof - so no change from previous years - with the main one, the height, being agreed at 600mm. Buffet breakfast was early on Friday, and it was a splendid spread as is often the case in Germany. Then it was a short journey along local roads with those arriving first keeping spaces so that as many of us as possible could park together. Course building soon followed, and then came the Course Walking. We were split into groups with eight minutes for each, all done at a pace unlike at home, with a strict running order as we have in Championship while wearing of your number. This rotated after each course with a new walking and running order. Even the Germans got in a muddle over this, and the paperwork became more and more complicated as the day went on. Special thanks to all the Grooms who helped get everyone in the right place at the right time and assisted with the recording. FCI Rules applied for what were, for us, longer courses, comprised 22 or so obstacles with 5-7 metre distances so opportunity for distant handling! Two German Judges, Lena Blascke, Alexander Beitl, and our own Graham Partridge set some fast and complex challenges that seemed to catch out most competitors even those from countries where they compete over FCI courses and train together. And are well sponsored! Unfortunately we don’t always have the opportunity to run FCI Courses during year. Friday started with Jumping Individual 1 where Tony 5F, Kate 10F, Paul 15F, Gill 20F with Es for Pen, Bev, Tina and Gina. Agility Individual 1 followed where Paul 15F, Bev 20F with Es for Pen, Gill, Katie, Tony, Tina and Gina. Then Jumping Team where Gina CR (clear round), Tony CR, Paul 5F and Gill 25F, leaving GB at 9th. Saturday started with Jumping Individual 2 where Gina 5F, Bev 5F and Gill 10F with Es for Paul, Kate, Tony and Tina. Agility Individual 2 followed where Tony CR, Gina 5F, Paul 25F with Es for Bev, Gill, Kate and Tina. Then Agility Team where Tony CR - there were only 10 - with Es for Paul, Gill and Gina. This left GB at 13th, finishing 11th overall on the combined Results, the top 3 scores being used. The Team Competition was won again by Finland, followed by Estonia in 2nd and Italy i 3rd place. Under FMBB Rules, the top 10 unqualified dogs from the four Individual Rounds go through to the Final on Sunday with one 'Best of the Rest' from each competing country. Paul and Tiber represented GB, having the highest place from the Individual Combined Results followed by Tony, Gina, Gill, Bev and Katie, with a great effort by all competitors. Both the Jumping Final, judged by Graham Partridge and Agility Final, judged by Alexander Beitl were stunning. Paul was unfortunate to have Es in both. There was a tremendous win for Spain (Malinois) followed by competitors from the Czech Republic (Groenendael) and Belgium (Malinois). Then there was time for a final bit of shopping and retrieving our Record Books and Pet Passports before the Prize Giving and Closing Ceremony where all Countries parade around the main Arena in their Team Kit and behind national flags. Sadly we missed the Opening Parade around the town held once the other disciplines had started - Cani-X/Bikejörging, IPO, Mondioring, Show and Obedience. We stayed the Sunday night before undertaking a similar Return journey. Monday it back to the Overnight Halt at Neheim, allowing time for an enjoyable visit to the historic centre of Halle and a restful walk for both participants and our dogs before we left. Monday was a Public Holiday in Germany so it was difficult to find anywhere open but a Café in the main square yielded the most enormous meals we had ever seen, and a memorable evening for everyone! On Tuesday we were back to the Channel Tunnel through traffic of the Ruhr and Antwerp, arriving in good time for Pet Reception and then soon back on the congested roads of Kent and beyond. 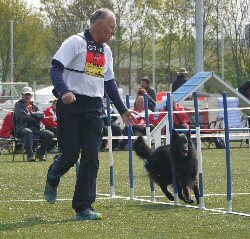 It was such a wonderful opportunity to see and compete against the best in the world as far as Belgian Shepherd Dogs are concerned. An enormous thank you to the BSDA of GB and WBSDS for their invaluable support and for assistance from The Kennel Club and Eurotunnel. Thanks also to the Deutscher Malinois Club for all their endeavours in organising the show and my wife Eva for putting up with even more paperwork! Next year the host country will be Slovenia, to be confirmed by the FMBB, having taken the place of Italy. For all those BSD handlers, the Selection Day for the 2018 FMBB Championships, will be held on Sunday,, 19th November in Warwickshire. Details to follow. If you are interested, please contact Michelle Griffiths by email on michelleg@talktalk.net or ring m. 07751 830654 before 20 September 2014. When it was confirmed that the 2014 FMBB (Belgian Shepherd) World Championship would be held in Finland, the options for travel to the event were investigated and a summary was presented to eligible potential team members. Because of the time and distance involved for competitors and their dogs, nearly all of them decided they would not be prepared to go. As there were not enough people to make up a team the World Championship Committee, made up of representatives from BSDA of GB and WBSDS, decided not to enter the competition in 2014. Both the BSDA and WBSDS are committed to supporting future training, selection and teams. On behalf of the Team the BSDA and theWBSDS would like to thank Andy Brown for an excellent day and Helen Brown for the hospitality and white dog. The 2013 FMBB World Championship will be held at Koper (Slovenia) from 1 – 6 May 2013. This year it is planned that a full squad of eight dogs will represent Great Britain. The selection day for the Great Britain Agility Team will be held on Sunday, 17 February at Sandbourne Stables, Baughton Hill, Earls Croome, Worcestershire WR8 9DG. The judge will be Andy Brown. All KC registered Belgian Shepherd Dogs Grade 3 and above that have a top 10 place in jumping and agility in the previous year are eligible for selection. Registrations close 1 February 2013. The aim of selection is to match the type of competition experienced at the World Championships so courses are FCI type and challenging. Although it is usually Grade 6-7 dogs that get into the team. Grade 3-5 handlers are encouraged to take part in order to get an idea of what is involved and to prepare for future years. There have been some notable exceptions with some outstanding lower grade dogs taking to the FCI courses and getting selected. The selection is solely based on the performance on the day, and it is in two parts. First is the team selection there are 2 agility and 2 jumping runs where the selectors are looking for consistency. So the dogs with the best four scores overall make up the team. This has proved very successful with Great Britain twice winning the team event at the World Championship and frequently getting very good places. The dogs in the team are automatically entered in the individual heats as well. However, another four dogs can take part in the individual heats only. So the second part is looking for those four dogs. At the World Championships only the best 10 from 2 x Jumping and 2 x Agility runs get through to the individual final. The standard is very high and the dogs are very fast, so the selectors are looking for the four fastest dogs that still go clear for for Individual event. This year the whole team will travel together by coach. The coach will leave Kent early Tuesday, 30 April and be back in Kent on Tuesday evening, 7 May. The entry fees, coach and hotels will be paid for by the funds raised by BSDA and WBSDS. As the funds are raised at agility shows run by BSDA and WBSDS, it is expected that people taking part in selection help at the shows. The BSD World Championships is a fantastic event held every year in a different country in Europe. In addition to Agility, there are the following events. An IPO competition which is the FCI rules for Schutzhund Mondio, a protection dog sport. FCI obedience at all three grades and also showing classes. Representatives from Great Britain will be competing in IPO and Mondio.